There was a time when I was completely obsessesed with mosiac work. I would get an idea, vision perhaps, and have to get right to work on it; trying new things, changes to materials, refinements, etc. Frequently, a soon as I finished the mosiac work on one item, I'd already be starting on the next ... letting several stack up before doing the grouting and completion work. Once completely finished, they get packed away here and there ... in closets; in the attic ... just moving on to the next idea. Well, I've run out of space and getting a new house certainly does not make sense. So, I'm pulling the pieces out one by one (going to try to do a couple a week) and decide what should be done with them. Four categories really .... 1) keep for myself (and I'm mostly out of wallspace and already have several of the largest pieces hanging), 2) Sell, 3) It's not so great and donate to Grans (perhaps they can sell for a few dollars and help feed those in need). There's a good stash in the closet in Lilly's room. Decided to start there. Pulled out this piece ... Planetscape. This piece was completed in 2004. 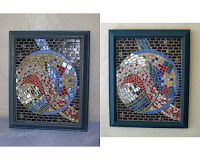 I'd upcycled a frame and actually completed the mosaic right on the sheet of glass. It is grouted into the frame. It's a great peice and I've decided to sell. It measures 13 1/2" x 16 1/2". Checked it over carefully and decided the the frame has suffered a couple scratches to the paint. I searched through all my paint supplies and no longer have the original grey blue that I put on this upcycled frame. So, selected an acrylic paint that a bit more blue. Updated the paint and let dry thoroughly and photographed. This piece is listed for sale (at a more than reasonable price because I'd like it to go off to a new home where it can be enjoyed) in my Artfire Shop.